These twix cookies have a shortbread cookie, caramel filling, and chocolate topping – just like a twix candy bar! How cute are these Twix cookies? I love how round and layered and pretty they are. And believe it or not, they taste just like a Twix candy bar! I made these for my Christmas cookie trays this year and they are almost always the first ones to disappear when I set them out! I guess people just love the flavor of Twix. 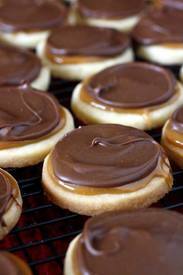 Just like their candy counterparts, these cookies consist of three layers – a shortbread cookie on the bottom, creamy caramel in the middle, and chocolate on top. Yum! !